Irishman endurance athlete and former drug addict Gavan Hennigan set a new international solo record by rowing 5,000km across the Atlantic in 49 days, 11 hours and 37 minutes. The bearded Hennigan made the grueling 3,000 nautical mile (5,000km) journey in a specialized ocean rowing boat across the world’s second largest ocean from San Sebastian in La Gomera, Canary Islands, to Nelson’s Dockyard English Harbour, Antigua in the Caribbean. 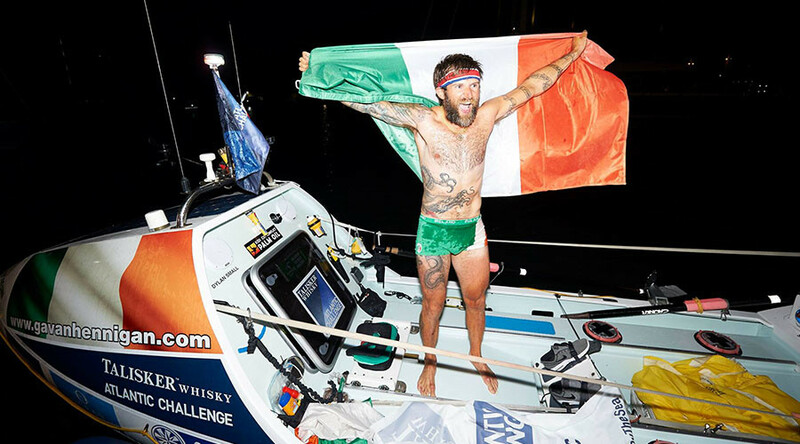 Upon finishing the mammoth journey, the tattoo-sporting adventurer from Galway celebrated the achievement on his boat, brandishing an Irish tricolor and clad in green, white and orange shorts with “Ireland” emblazoned on the rear. “I just got sent through some of the stuff and I’m just absolutely blown away by the amount of people following me, people following the tracker sending messages of support,” said Gavan in his first interview after finishing the race, given portside while still standing on his boat. “I had so many messages of well wishes and people just telling me to keep going. I’d get up a few days and I’d really be struggling and I’d just read a few of those just to help me keep going. “I wouldn’t have done it without everyone’s help. Seriously, it’s amazing. Thanks to everyone back home in Ireland. I’m so proud as an Irish person to come in and do this race. Not many Irish people have done it. “Just to represent the country, just to fly the flag, it’s been amazing,” he added. Hennigan, who bore a resemblance to MMA superstar and fellow countryman Conor McGregor in his celebratory outfit, became only the second Irish person to complete the challenge after Shane McGowan – whose record Hennigan beat by 69 days, therefore also setting a national record. The feat is all the more impressive given that Hennigan battled drug and drink addiction for most of his youth as he struggled to admit his homosexuality. It eventually landed him in rehab at the age of 21. Following his recovery, Hennigan worked as an oil rig worker before becoming an “extreme environment athlete,” completing challenges such as travelling 700km north to south across Lake Baikal in Russia with a 60kg sled in 17 days. Hennigan, who goes by the name ‘Soulo Gav’ when competing, completed the challenge while raising money for youth mental health charity Jigsaw Galway and Cancer Care West. He raised over €12,000 ($13,000) for local Galway charities by taking on two Arctic races. Four-man teams ‘Latitude 35’ (USA) and ‘Row for James’ (UK) finished first and second respectively, followed by Hennigan, with American Oarsmen (US) coming in fourth.